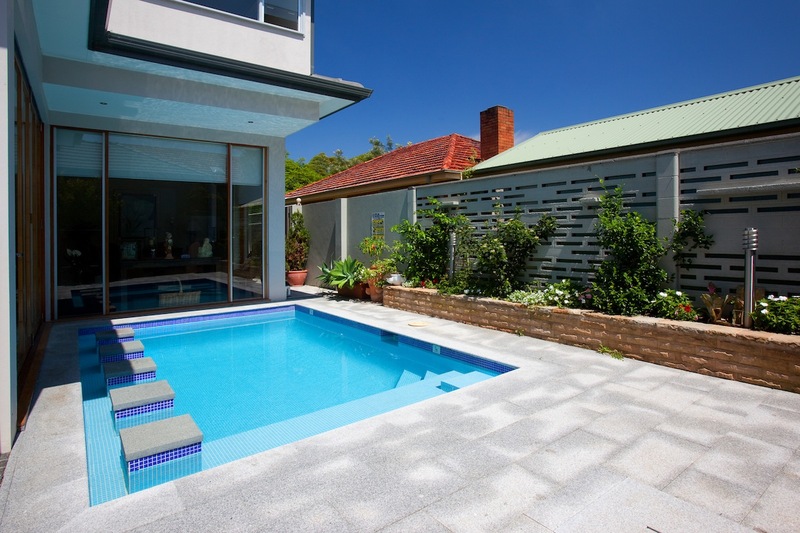 This multi-purpose Sunset designer pool cleverly caters to all the needs of this homeowner’s flexible lifestyle blurring the traditional delineations between house, garden and swimming pool to create a single multifunctional leisure environment. eight by four swimming pool is on further examination a well-conceived multi-purpose entertainment feature. This exclusive Sydney residence’s entertainment and leisure area has been augmented by Sunset Pools with this cleverly designed ‘wet extension’. This cleverly conceived Sunset swimming pool’s inclusions expand its traditional role to fully embrace the resident’s relaxed and social lifestyle. Creative attributes that have already earned this pool a supporting role in an Australian made movie, and Sunset Pools a prestigious design award nomination. This Sunset pool exemplifies the established movement towards incorporating domestic swimming pools with the homes entertaining area. 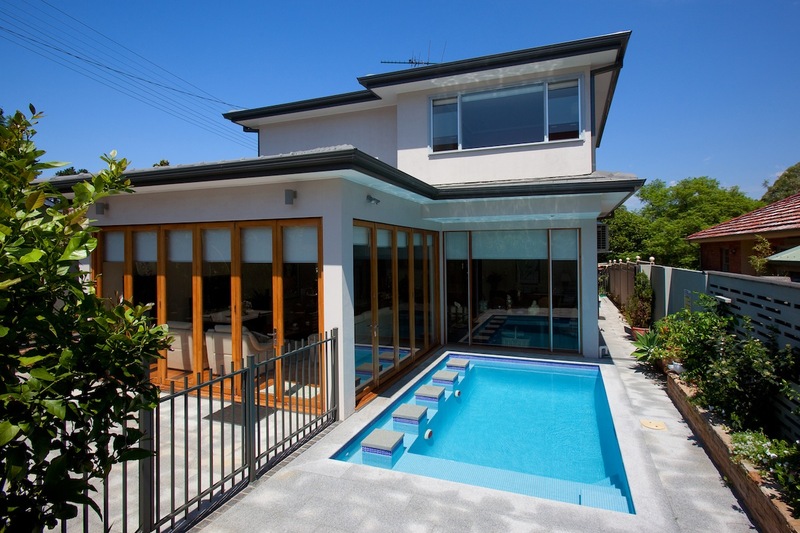 This one-off designer pool is a genuine example of integrating the pool into the homeowner’s flexible lifestyle, where the house, garden and swimming pool have been considered as a single entity capable of adapting to the varied needs of a growing family’s leisure needs. 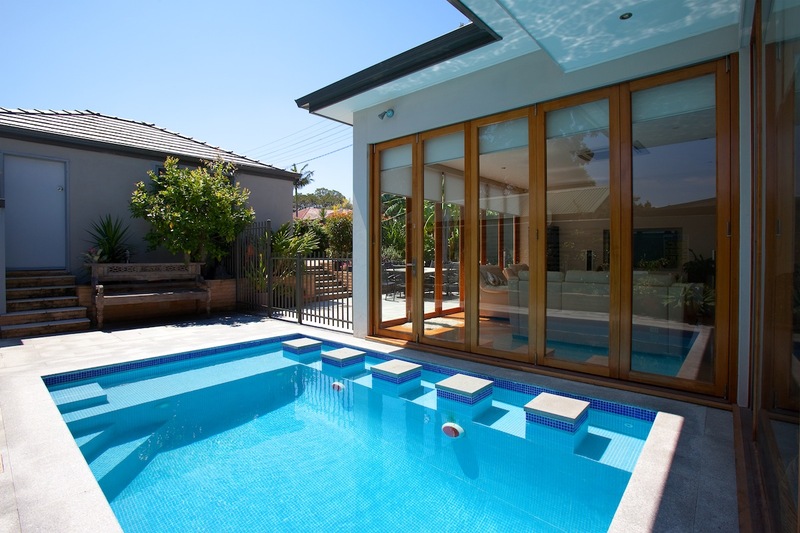 Fully glazed floor to ceiling bi-fold doors open to merge the pool with this home’s adjacent indoor entertainment area and the five prominent floor level stepping stones. 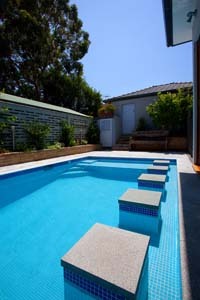 The stepping stones rise out of an expansive 1.2m wide swim-out that extends along the pool’s length, then turns 90 degrees to become a wide beach at its shallow end. The beach provides a safe shallow (450mm deep) play area for the family’s children. The swim out between the stepping stones provides cool summer seating that converts the stepping stones to table tops for casual alfresco dining. Alternatively, guests (or the kids) can sit atop the plinths to view a giant flat screen TV positioned inside. 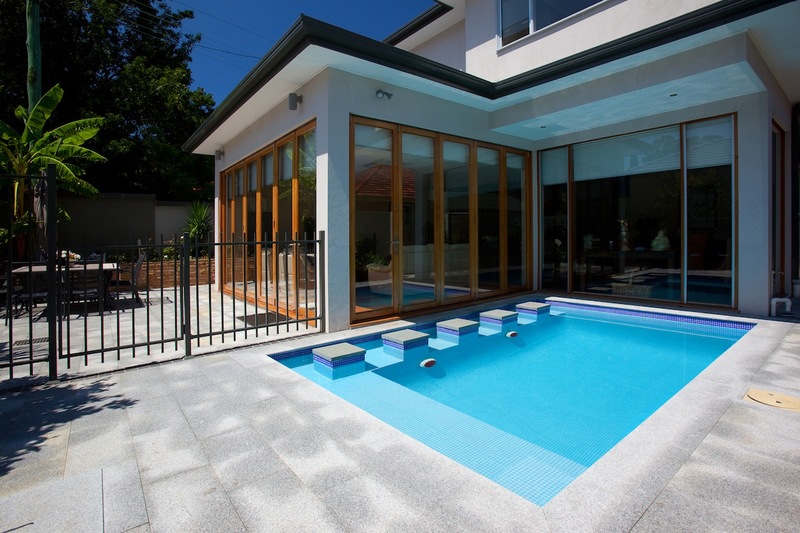 Sunset Pools specialise in the design and construction of truly innovative pool concepts, individual designs that can not be effectively addressed by the less imaginative swimming pool contractors. Like you, Sunset is selective and makes sure that the highest level of workmanship is maintained and guaranteed throughout your pool’s construction. 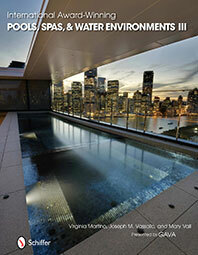 You too could be the proud owner of an exclusive new Sunset swimming pool, as individual as you and your family. Call Sunset Pools today on 1300 000 412 to add value to your home or complete the enquiry form to find out all you need to know.